...says Baptism Valid Even Without Faith! 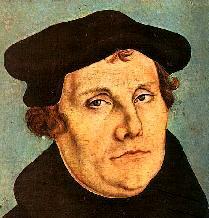 Martin Luther (1483-1546) was a fraud, a heretic. Tragically, this man who has been dead for 469 years is still brainwashing people with his damnable heresies, leading them into Hellfire. "...the central truths of Christianity, the most important of which, for Luther, was the doctrine of justification — God's act of declaring a sinner righteous — by faith alone through God's grace. He began to teach that salvation or redemption is a gift of God's grace, attainable only through faith in Jesus as the messiah." SOURCE: Wriedt, Markus. "Luther's Theology," in The Cambridge Companion to Luther. New York: Cambridge University Press, 2003, 88–94. Mr. Luther penned these words in 1529, twelve years after his alleged conversion to Jesus Christ in 1517. How much more evidence do you need to know that Martin Luther was an imposter, a Modernist, and an unsaved man? BLASPHEMY!!! How can a lost sinner be saved without faith? No such damnable doctrine is taught in the Bible. "The Christian belief that baptism is necessary for salvation is so unshakable that even the Protestant Martin Luther affirmed the necessity of baptism. He wrote: 'Baptism is no human plaything but is instituted by God himself. Moreover, it is solemnly and strictly commanded that we must be baptized or we shall not be saved. We are not to regard it as an indifferent matter, then, like putting on a new red coat. It is of the greatest importance that we regard baptism as excellent, glorious, and exalted' "(Large Catechism 4:6). "He that believeth and is baptized shall be saved; but HE THAT BELIEVETH NOT SHALL BE DAMNED." Mr. Luther is a liar of liars, who is still deceiving people nearly 500 years later with his teachings. This is because of the power of propaganda. This is why Adolf Hitler (1938), Joseph Stalin (1942), and President George W. Bush (2000/2004) have all been honored by TIME magazine (a known Communist organization). 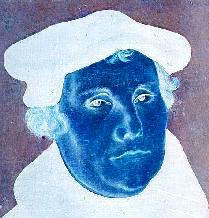 Mr. Luther was unquestionably a great religious leader of his time. Luther did much work to translate the Word of God. There is no question that Luther was a pioneer of the Reformation. Yet, tragically, Martin Luther taught ANOTHER GOSPEL (2nd Corinthians 11:3-4), which is a false plan of salvation that cannot produce the new birth by the Holy Spirit of God. Mr. Luther had churchianity, but he did not have Christianity. Religion cannot get a person into Heaven. I am not asking you to take my word for it; but rather, consider what the Scriptures teach, and then look at what Mr. Luther taught. They are diametrically opposed to each other. Those who promote Martin Luther are pulling on the same rope as the Devil.